From 1898, pioneering female recording artist Minnie Emmett sings Baby, Baby, from Lady Slavey. Announcement "Baby, Baby, from Lady Slavey, as sung by Miss Minnie Emmett for the Columbia Phonograph Company of New York and Paris." Minnie Emmett was the first American female recording "star". The primitive recording equipment of the time did not, in general, do justice to the subtleties of the female voice. However, Miss Emmett was able to finesse her voice to avoid the fate typical of early recordings made by women  harsh tones and poor sales. This recording is also remarkable for the uncommon announcement. Usually, record companies preferred the leather-lunged bellow of a male announcer, but Emmett would often announce her recordings. 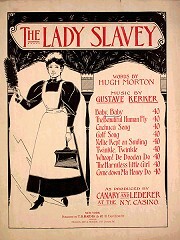 The operatic comedy "The Lady Slavey" was written by Hugh Morton and Gustave Kerker in 1896. A copy of the sheet music to Baby, Baby, courtesy of The Lester S. Levy Collection of Sheet Music.